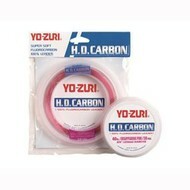 Yo-Zuri Fluorocarbon Leader pink 100lb 30yd. The disappearing trick. Let’s take a look at leader or trace, AKA the piece of line that the fish sees, or doesn't see, which should be the case. 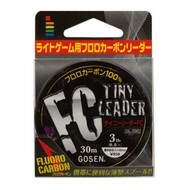 Leader comes in a wild array of materials and sizes but you can narrow it down to two basic families (excluding the wire variety): monofilament and fluorocarbon. 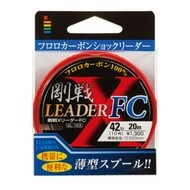 We've all fished with mono leader for the longest time. Usually it's just a piece of mainline of a lighter or heavier breaking strain than the main line. Lighter is always better but we’ll focus on that in another column. 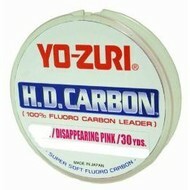 The big advancement in leader material is fluorocarbon. It’s virtually invisible in the water, has good abrasion resistance and… is ten times the price of mono. But fluoro gets results. While predominantly used for presenting lures, fluoro is also used for hunting big fish, stray-lining and for stealth presentation.. Fluoro can be hard to tie to some main lines and there is some, with ultra hard casing, that slip, cut and “chatter”, causing damage, when you pull it tight. 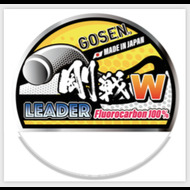 Enter Gosen fluoro, invisible and tough. 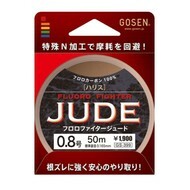 Japanese company Gosen make the best. It ties nicely and has excellent knot strength and won't chatter when it synched up. 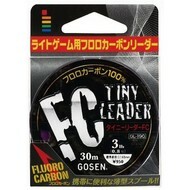 The recommend fluoro line weights for soft-baiting is 12-15lb, maximum of 2m length. Inchikus and slow jigs, butterfly and slow pitch jigs use 20lb, 2m length. Live-baiting for kingfish 50-100lb, and heavy duty jigging 100-150lb (but we recommend new YGK Absorber monofilament for heavy duty jigging). Monofilament still has a place, for deeper water and green water. Price is also a consolation, but to increase the opportunity for more bites when the fishing is hard, fluoro is hard to overlook, even though its hard to see.